Both sides went into this North London derby on the back of some good form. Arsenal had beaten Aston Villa 5-0 in their last outing as well as pulling of a 0-2 shock away to Manchester City in their previous Premier League match. Tottenham impressively beat West Brom 0-3 last weekend with Christian Eriksen and Harry Kane currently being in the best form of their lives. Arsenal were again without Alexis Sanchez due to a hamstring injury and made one change from their victory last weekend with Welbeck replacing Theo Walcott. It came as surprise to many that Arsene Wenger chose Welbeck to play right midfield instead of Walcott. Walcott played very well on his return from injury against Aston Villa and Danny Rose’s tendency to play high up the pitch for Tottenham at left-back could have been exploited by Walcott’s pace. Welbeck was chosen for his defensive capabilities and work rate and did quite well, limiting Tottenham’s chance creation on their left wing as well as using his pace impressively on the counter-attack, making a large contribution to Özil’s opener after beating Rose. Welbeck was replaced by Walcott in the 78th minute. Walcott played a more advanced role than Welbeck, positioning himself closer to Giroud. Walcott never had a chance to hurt Spurs with his pace especially as Tottenham sat back with a deep block after Harry Kane’s 87th minute winner. The winning goal showed us why Welbeck was preferred to Walcott as Bentaleb was given too much time and space in Arsenal’s wide right position to play a long ball for Kane to head in to the top left corner. Walcott was in a very deep position and failed to push up to press Bentaleb when the ball was played back to the Algerian. Arsenal’s aforementioned win against Manchester City came with Arsenal having only 42% of the possession. This was very unlike Arsenal who are normally praised for their attractive passing play and studied build-up. Arsenal played in a similar fashion Vs Aston Villa with only 47% of possession despite their 5-0 home win. Arsenal had the lower share of possession again today with 43% due to standing off Tottenham and allowing their Centre-Backs to build-up fairly high up the pitch. Giroud stood off Vertonghen and Dier (Vertonghen achieving 87% pass completion, better than any other player for either side). 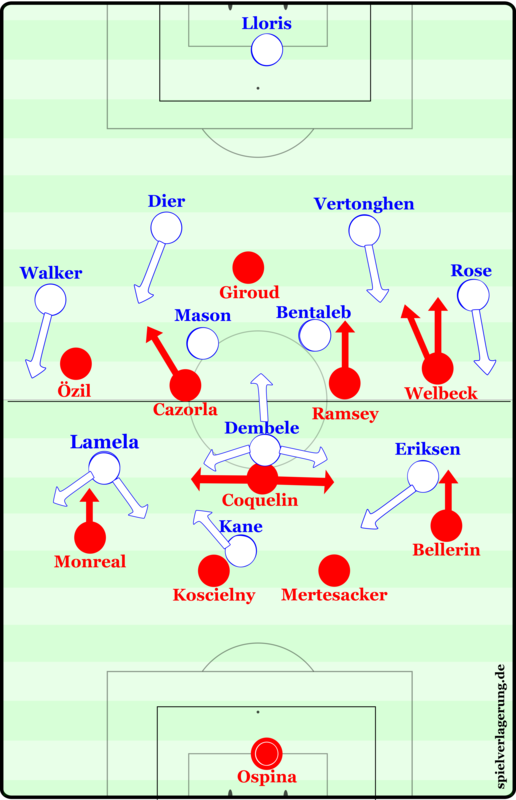 Arsenal’s midfield 4 stood in close proximity to Tottenham’s fullbacks and double pivot of Mason and Bentaleb whilst Coquelin was very tight to Dembele in an attempt to reduce Spurs’ ability to play longer vertical passes. Coquelin, who has received much praise over recent weeks, wasn’t at his best as he allowed Dembele 83% pass completion–the second most of any player, as well as allowing him to create four chances (joint top with Eriksen). Ramsey and Cazorla also didn’t do enough defensively, allowing Mason and Bentaleb four shots each–the most of any players (joint with Kane). In possession, Arsenal were disinterested in a slow, studied build up and were the more vertical of the two teams. Arsenal played a fairly deep block in the defensive phase so had to rely on Welbeck’s pace to get them up the field quickly in transition. This had the potential to work well as Tottenham’s back four looked very chaotic and disorganised when running towards their own goal, not least for Arsenal’s opener. Despite this, Arsenal never really capitalised on this and were often too sloppy in their link-up play when attempting to move up the field at pace. Mesut Özil is obviously one of the most creative players in the world when he has the ball but far too often he goes missing for long periods of matches. Other than his good reactive finish for Arsenal’s goal he did very little in the match, completing only twenty passes all match (74%). In my opinion, this was down to him being played on the left side of a midfield four. He cannot influence the game from this position and doesn’t have the pace of a conventional winger. Also, Giroud isn’t the type of forward to make diagonal runs in behind the centre-back for Özil to find with a pass. Furthermore, this wasn’t Özil’s sort of match because, as I have mentioned, Arsenal were playing a more direct game so Özil couldn’t do what he is best at–unlocking defences with killer through balls. Harry Kane, scorer of both of Tottenham’s goals, showed his versatility as he was forced to play differently to how I’ve seen him before. Last week Vs West Brom he made his mark with clever runs behind the defence and good finishing. Arsenal’s deep block didn’t really allow him to do this and Coquelin in between the lines meant he couldn’t shoot from longer range–in fact, he only registered 4 shots all match (2 of which were goals). He was forced to drop deep to find the ball and linked up play well. He also wasn’t afraid to run deep into his own half to try to tackle back and regain the ball for his team. Kane showed his striker’s instinct to be in the right place at the right time for his first goal and showed his aerial ability for his second, peeling away from Koscielny very well. Tottenham again showed their ability to create chances against the top sides. Their pressing forced Arsenal to move the ball quicker than maybe they would have liked to and used their fullbacks effectively in attack. Despite this, Arsenal’s tactics worked in the first half which highlighted Tottenham’s need to address their personnel and organisation in the back four. In Harry Kane they have one of the most talented young strikers in Europe but they mustn’t become over-reliant on him as he will inevitably have patches of bad form. Arsenal need to either change their new counter-attacking system or sharpen up on it more thoroughly as they too often let opportunities to counter-attack effectively go to waste. They don’t look anywhere near as dangerous without Alexis Sanchez and need him back as soon as possible to make sure of a top-four finish. you failed to mention the fact that there is a large proportion of Arsenal players who do not have a defensive mind set: Ozil rarely tracks back, which meant that the left side of Spurs attack could dominate. Duncan, I have to agree with your point. It has been really intriguing to watch the adjustments Ponch has done with Spurs over the last month or so. I would have never thought to see Drembele at a no 10 role because I just don’t think he is a great passer/playmaker. What he is though is a great ball winner and being that high up the pitch makes it a nightmare for the other team when they are counter pressing. This analysis neglects the role Dembele had in breaking up Arsenal’s defensive shape. His ability to dribble while holding off 2-3 Arsenal players around their box was a key factor in making space for Spurs to attack into.